Traxxas created another hit when they introduced the 4 x 4 SLASH. Durable, fast and most of all, fun to drive. Traxxas is the company that started the short course truck craze, just like they did with monster trucks several years earlier. It didn’t take long for the other names in RC to come out with their version’s of short course 2wd and 4wd vehicles of their own. Manufactures like Losi and Associated who tend to make competition level vehicles, were quick on Traxxas’ heels and released better handling versions that the more racer oriented folks typically purchase. Enter the Traxxas low CG conversion. The already good 4 x 4 SLASH could now be made to handle even better by converting the chassis and a few other components, which lowers the overall center of gravity significantly. The lower the CG, the less potential for body roll, the better handling the vehicle will be, which should make the vehicle faster through the turns. Since the shop has an older SLASH 4 x 4 demo vehicle for customers to drive we thought it would be neat to see just how much better the new chassis design is. The idea being that we would bring the stock SLASH to our local indoor track, (Smac Trac), to get some average lap times from a couple different drivers. Then convert over to the new low CG chassis, and have those same two people get average lap times for comparison, hopefully proving that lower CG will improve lap times. Traxxas part #7421 includes everything needed for the conversion. 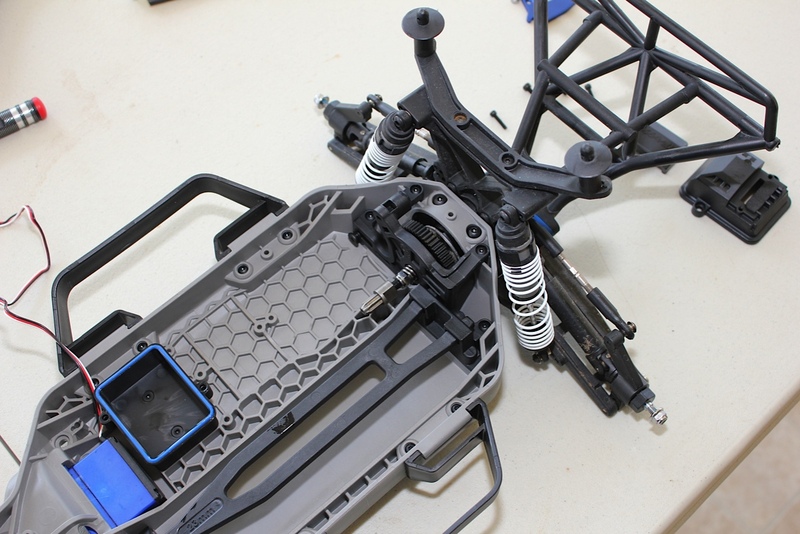 Chassis, new style battery strap (no more body pin), motor mount, and front and rear suspension arm mounts. It also includes a little instruction sheet exploded view showing how it all goes together. The conversion itself took about 3 hours to complete. After tracking average lap times for Dennis Fischer and myself, our two average lap times came out to 25.29 on the original version. The low CG conversion dropped our average time to 23.67. That is over 1.5 seconds faster! The addition of sway bars, GTR shocks, and a center diff should make it faster still. This is a perfect example of creating speed, not by increasing horsepower, but by making a better handling vehicle. Conclusion: We thought that lowering the CG would make for a better handling car, which in turn would make for faster lap times, it did!